Posted December 2, 2015 by Amie Barbeler & filed under Bar, Bar Food, Booze, Cocktails, Eat & Drink. I’m sitting in a glamorous L.A. country club. No wait, maybe it’s a yacht club. In Darlinghurst. And I’m eating lobster mac ‘n’ cheese and drinking bubblegum-infused cocktails that have been delivered to me by a girl who looks fresh off the tennis court. Confused? Me too. “We like to think of the Darlo as a new age social club,” the manager tells me, which does not actually clear up anything at all. Identity crisis aside, I was stoked to see the bar snack offerings included Lobster and Truffle Mac’n’Cheese ($24), which for the record, tastes every bit as obnoxiously decadent as it sounds. 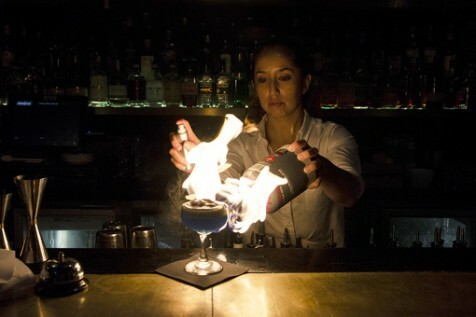 The cocktails are bespoke and beautiful, and then you have the curious candy cardiac arrest that is the flame-grilled fiery Bubbarita ($19) – a bubblegum flavoured margarita with a Hubba Bubba infused foam. Novelty drinks, lobsters, tennis skirts, fire and live music… I’ll be back.